Our restaurant belongs to a successful group of restaurants/catering industry in Ribeira of Porto. The idea was to bring something new to Ribeira. Our concern was to find a suitable space on the riverside area, and as always, in order to preserve or better requalify this space, considerable works were made both in terms of Security as well as in terms of the recovery of this space, highlighting its history and antiquity. Our facilities are inserted in Fernandina Wall with over 400 centuries of history. During the fourteenth century, Oporto had a large urban expansion out of its initial core of the hill of Pena Ventosa, around Sé, protected by the Cerca Velha, built on top of the original Roman wall. 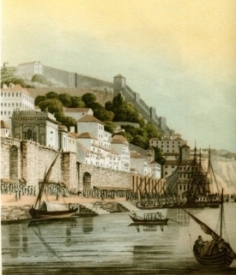 This surge of settlement was particularly noticeable in the river bank of the Douro, reflecting the growing importance of trade and maritime activities. The city, therefore, feels the need of a wider walled space than that of the Cerca Velha. ones to submit that claim were bourgeois with houses and businesses outside the walls and, therefore, less protected. In the mid 14th century, still at the time of King Afonso IV, a new line of walls began being built, being one that was almost completed around 1370. 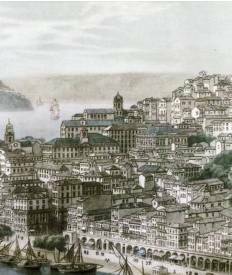 The fact that this work was only completed in the reign of D.Fernando, explains why it is commonly named as " Muralha Fernandina" (“Fernandina Wall”).. Since 1996 the historic center of Porto is part of the Cultural Heritage of the United Nations Educational, Scientific and Cultural Organization (UNESCO).